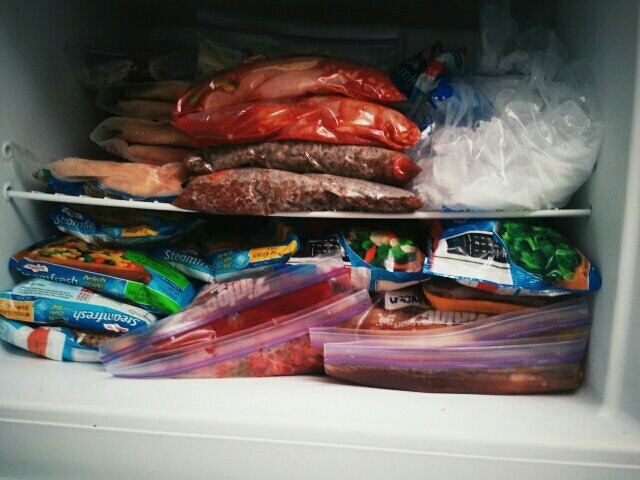 February 1, 2016 / Katie V.
For some time now I’ve been planning and prepping the meals for my family on Sunday nights. Every Sunday I’d shop and bring home large quantities of food to be prepared before the week officially began. This way I could have multiple meals done in one evening and all it would require is a little reheating. The thought behind this was that I was a) saving time, b) saving money, and c) keeping my family fed with healthy homemade meals but not killing myself each night cooking a new meal. Then I was informed by the men of the house that they didn’t really enjoy the whole “leftover” thing. What? Well, that threw a wrench in my plans! So much so that I haven’t really cooked any meals at home lately because I haven’t found my rhythm yet. Thinking ahead of individual meals AND shopping in lower quantities rather than mass producing meals one day a week so I didn’t have to think too much about it throughout the week just isn’t sinking in. So I have some retooling to do in the kitchen. I need to find a way to cook a meal every other night that will keep dinner healthy and fresh. I’ve tried freezer meals where I packaged up multiple crock pot meals in one sitting to be spread out and used over the week. I could attempt that again though I do find the crock pot meals to be a bit bland. I always have to add extra seasonings when they are finished. And the prep time was extensive. I had to block a good 4-5 hours to clean, chop, measure, cook the meat, then dole the right ingredients into the right bags. Although it took some time and it did need extra seasonings, this came through when I was out of the country and my husband needed dinner or when we had lots of plans after work and school. In the end, I’m not sure what I’m doing but I’ll definitely need to figure something out sooner rather than later!! If they want fresh cooked every night then I would say which nights are you cooking!! 😀 The reason you find slow cooked meals bland is the seasoning is added too early and the aromatic oils that give the most flavour from your herbs and spices have “evaporated” off. Lynne thanks for that tip about the slow cooker and the spices. I’ll do more research as to when to add those goodies so it’s not so blah! My mom does have a pressure cooker for me to test out so I’m tempted to borrow it and give that a whirl! I’ve seen a few menus that started with cooking a few main things the first day and then incorporating them into a variety of meals over the week so that each subsequent meal needed little additional work but looked entirely new to unsuspecting menfolk. My mother-in-law is very skilled at transforming meals as well. A soup one night becomes s curry later in the week, or a meat and potato stew becomes croquettes…I’ve not yet mastered the skills! That kind of how I started off by making batches made into other things through the week. Then I got lazy and we’d just eat the chicken or the turkey or the beef with sides but not made into a bigger recipe. Maybe I need to go back to this habit! !